These are cumulus clouds. They are puffy. Cumulus clouds are clouds that are piled up on top of each other. “Cumulus” means a pile in Latin, as in our word “accumulate” meaning to pile up. They are puffy clouds. 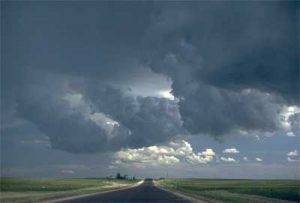 Sometimes cumulus clouds are white and there are only a few of them in the sky; other times they can be heavy and gray. They’re usually low-level clouds, only about 1000 meters (3300 feet) above the ground. These are also cumulus clouds, even though they look a little different. They’re still puffy. When do you see cumulus clouds? Usually you get cumulus clouds when warm air rises from the ground carrying water vapor with it by evaporation. When the warm wet air rises up and meets some cold air, the water vapor gets colder and condenses into drops of water, making a cloud. Which cumulus clouds are rain clouds? When cumulus clouds are white and puffy, that usually means it’s not going to rain right away. But if they grow into big gray clouds, you can expect rain. Or it might snow if it is cold enough. White clouds are thin and let a lot of sunlight through them – that’s why they look white. Gray clouds are thicker, with more water. Less sunlight gets through them. A nimbus cloud is one that has rain or snow falling out of it. So a cumulo-nimbus cloud is one that is puffy and has rain or snow falling out of it. A stratus cloud is one that covers the whole sky like a blanket. So a strato-cumulus cloud is a combination of that blanket with a cumulus cloud. It’s a cloud that covers the whole sky, but is still puffy like clumps of cotton balls. Looking for a second source to cite? 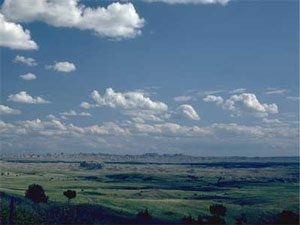 Check out this excellent article about cloud types from the National Oceanic and Atmospheric Administration. Cite this page: Carr, K.E. Cumulus clouds – Weather – Science. Quatr.us Study Guides, August 20, 2017. Web. April 20, 2019. This is just the info I needed for my project thank you a lot Dr.Karen Carr. I’m glad we could help, Lizbeth! Cumulus clouds are very interesting. Wonderful! I’m glad you liked hearing about them, Charlie.